What a concert this must have been. Two grand Te Deums, performed in the magnificent Chapelle Royale at the Palace of Versailles - I can only glow green with envy. The event was part of an ongoing series of “spectacles” at the Palace that celebrate its musical heritage. The Te Deum is normally associated with a grand celebratory event, such as a military victory, royal wedding or coronation. Lully’s was written for the birth of his son, still an event for celebration, especially when the child’s godfather is the King of France, but perhaps less grand than usual. Even less grand was the reason that it was given a further performance: Louis XIV had just recovered from a medical condition, and subsequent horrific operation, that began with … how can I say this discretely … a problem that prevented him from riding his horse, or indeed anything that required sitting down. It was at this performance that Lully notoriously and tragically beat time with his stick so vigorously that he damaged his foot, and later died of complications arising from the injury. 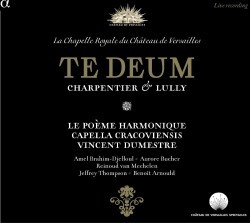 A Te Deum by Charpentier was also performed at the celebration for the King’s recovery, but the one recorded here was written five years later for a more normal circumstance: one of Louis XIV’s military victories. Both works are as you would expect: grand — apologies for continuing to use that word, but it is completely apposite — and uplifting, with vocal soloists, a choir, and much use of kettle drum and trumpets. The booklet notes, which are very comprehensive though occasionally confusing due to translation issues, describe a change in style between the two works. The Lully, using the soloists as much as a small chorus as individually, is dominated by choral singing. By contrast, the soloists in the Charpentier get much more opportunity to show their wares. I had not encountered any of the performers before this. The choir, Capella Cracoviensis, numbering twenty-eight, is from Krakow in Poland. The orchestra, Le Poème Harmonique, of similar size, plays authentic instruments, and was formed in 1998 by Vincent Dumestre. It is closely associated with the Alpha label, having been involved in its first release. The performances are uniformly excellent, and the historically-informed approach to the works sounds just right. Each work has been recorded more than a dozen times, and by such luminaries of the early music world as William Christie and Marc Minkowski. I have not heard any of these, but I doubt they would be superior to this new release.